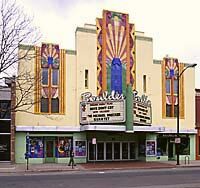 From opera to movies to disco to rock - the historic Boulder Theater has a diverse and colorful past that is being continued with a thriving present and is primed for an exciting future. It features top acts, some of which perform on E-Town, the nationally syndicated radio show that makes its home at the theater. Opened in 1906 as Curran Opera House by wealthy billboard sign owner James Curran, the venue featured opera, musical productions and silent movies. In 1927 the first talkie, "The Jazz Singer", was presented by Warner Brothers. With the advent of the motion picture, all live performances ceased as the theater became a movie house from 1927 to 1978. During the Depression, the theater kept going with double features and "Country Store Nights", when sacks of groceries were given away to those in the lucky numbered seats.